SCAMP Camps and other things. Its going to be a busy few months from July onward. With partner Howard Rice I’m involved in three SCAMP camps, one in Port Townsend, One in Baldwin Michigan, and one in Port Aransas. I’ll be running tool skills classes entitled Essential skills for the Beginner Boatbuilder” in Port Townsend and at Port Aransas as well as being involved in sailing classes at both of those venues. The tool skills classes cover use of planes and chisels, drills and countersinks epoxy glue including making joints, coating and using fiberglass and making taped seams, reading plans and drawing out full sized ready to cut, setting up and using some of the big tools such as bandsaws and sawbenches, use of sanders, angle grinders, jigsaws and so on. More than enough to give you a flying start to your boatbuilding career. 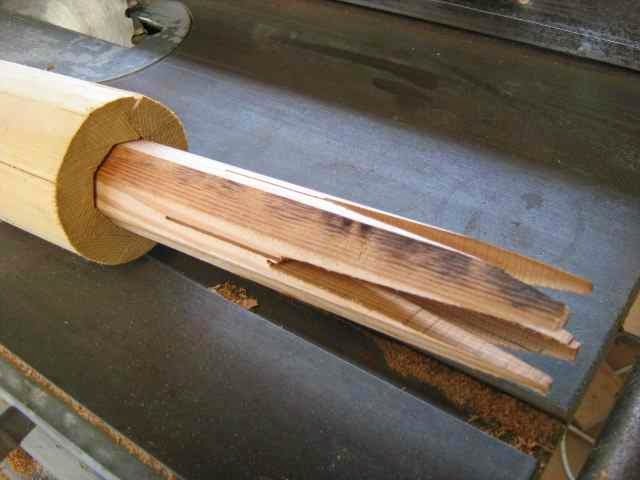 I’ve had several off blog questions about cutting scarf joints in the staves for the birdsmouth masts I’m making. Its no big deal, an accurate angle cut in each piece and a means of clamping them together and protected from any contact with anything else so the glue wont stick the assembly to anything else. To make the angle cut, I’ve taken a piece of heavy plywood, glued and screwed a rail on the underneath. That rail is of a size that slides easily in the groove in the sawbench table. I then ran the plywood on its rail through the saw to get the edge accurately lined up with the saw blade. On that plywood I screwed and glued a rail, 20mm square, at the right angle for the scarf joint, and fitted a section of the mast stave alongside it, then screwed, one screw at each end and no glue another stave on the other, the saw, side. Next was a block to make it easier to fit a clamp to the assembly. 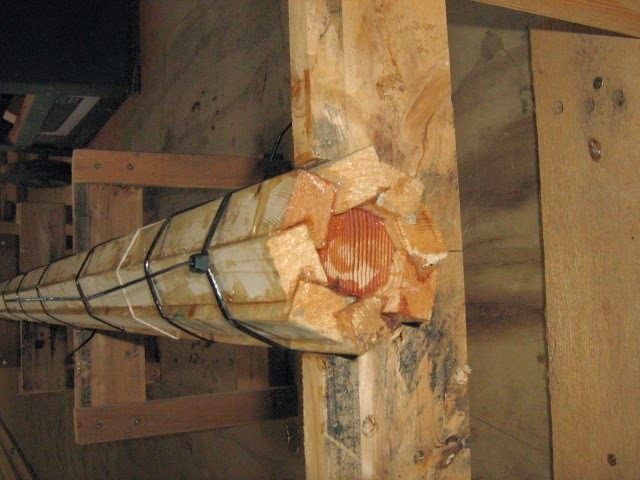 The clamp springs the screwed but not glued rail against the stave to hold it. Make sure that the clamp is well clear of the saw blade. Next was a handle with which to push the “sledge” through past the saw. 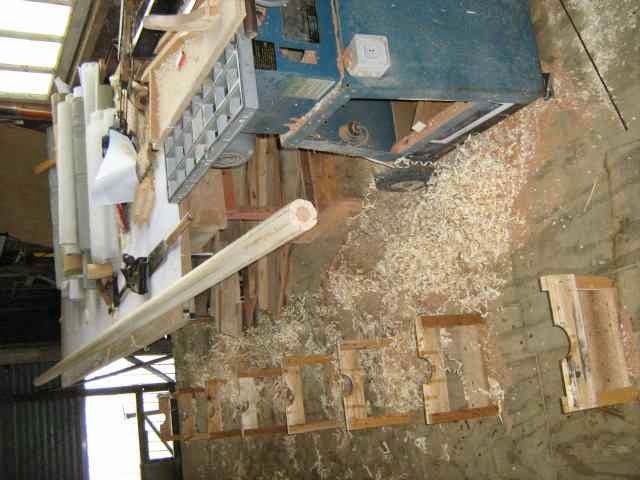 It is important to keep the end of the stave up at sawbench height as its run through, but otherwise once built its very simple to cut perfect scarf slopes. I’ve a stack of Australian hardwood 45 x 90 lumber. Dead straight, ideal to clamp my pieces to. So with kitchen wrap around each piece, they’re coated with epoxy and clamped up. Leave them for a day or more and you’re done. Finished scarf. Note that these are 5.5 / 1 scarfs, plenty strong enough, but if you are at all concerned about the accuracy of your work you can increase that to 6/1 or even 8/1. But not less, my test rig has verified these figures. I’ve not been able to do much in the workshop for a couple of weeks, figured that I’d get started again on a light and easy project. Just to get the ball rolling again, so its time to build the mast. 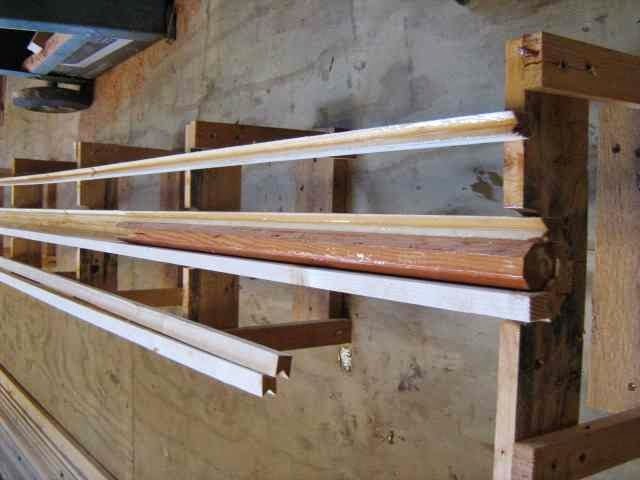 I found some merchant grade “Baltic Spruce” at BBS Timbers Auckland branch (http://www.bbstimbers.co.nz It’s a bit knotty, but its cheap and by getting enough for two masts I have enough to be able to select, and if needed cut the worst knots out and scarf the pieces back together to make up a reasonably clean mast. I’ve chosen to make a “birdsmouth” spar, my usual preference being to carve the spar from solid then split it on a table saw and router out the center. 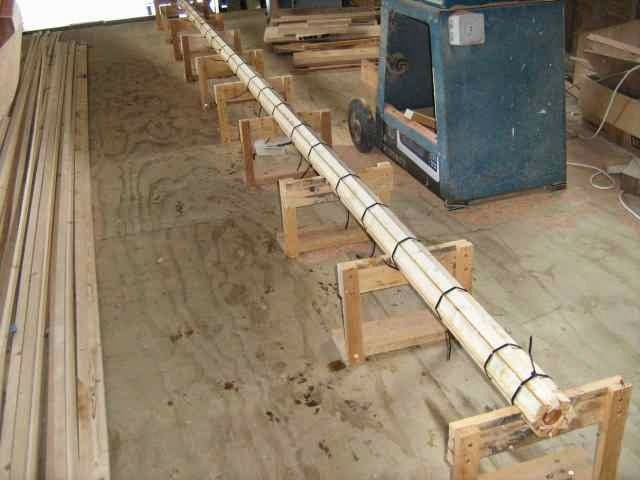 There are advantages to doing it this way especially if a variable bend mast with an integral sail track is needed, but this time being a plain unstayed mast for a balanced lugsail I figured that I would try using low grade wood and an 8 sided birdsmouth construction. Note that the 8 sided mast means that the angles of the vee are 45 deg 45 deg which means one setup on the sawbench to cut those angles. Not that I’m lazy or anything. I’d used the birdsmouth calculators on duckworksmagazine.com to give me the sizing and angles, here they are. Blair came over to help run the 50 x 100 pieces through the thickness planer, then over the sawbench to produce the required sized staves, it’s a bit tedious but in about an hour we did enough staves to build two masts with four spare staves in case I needed to chop a few knots out and scarf the pieces back together. 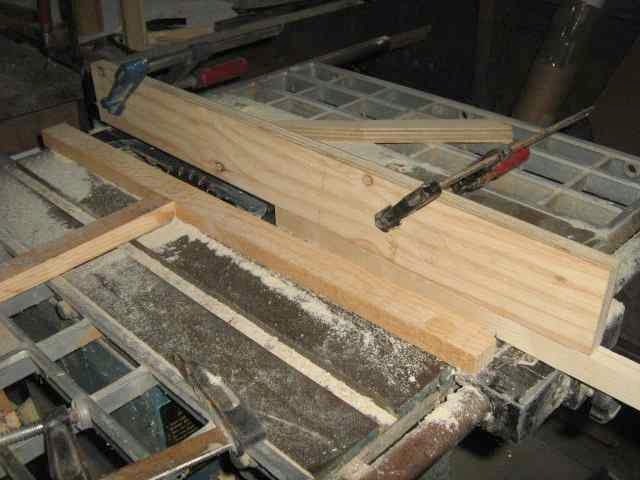 I made a simple jig to control the pieces as they were run through the saw to make the "vee" in one edge, just end for ending them to get each side of the groove. Those "guide pieces are a fairly close slide fit to make sure that the grooves are consistently the same full length on all 8 pieces. 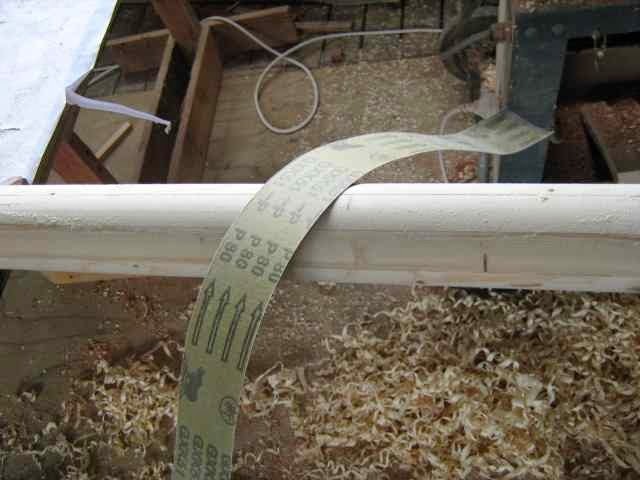 With the saw blade set at 45 deg and the right height, its a simple matter to push the staves through, then end for end them and run them through again to get the other half off the vee. That took about 20 mins to do the whole run of 10 ( two spares) pieces. Here are some of the offcuts part assembled to show how the system works, its my "check piece" to make sure I've got all the angles and dimensions right. My “shop” is not big enough to have a long bench, long enough to assemble the 4.2m long mast on, so I’ve made up a series of little stands and set them up on the floor using my much loved little laser level to get them lined up. 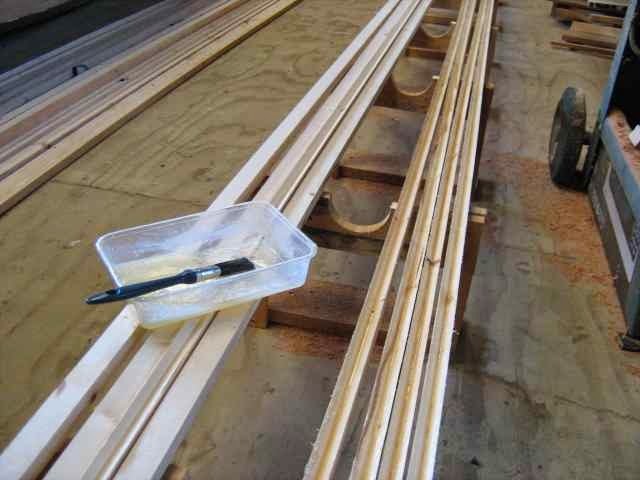 They look like a line of little croquet hoops as much as anything, but the cutouts line up to form a jig within which the staves can be assembled. Applying the glue. I've discovered by the way that the local "Dollar shop" sells brushes much more cheaply than the "chip brushes" that I'd been using, 6 of these are $2. They're very poor for paint but ideal for glue, I dont feel at all guilty about using them once and throwing them away. Glued them all up yesterday, ran the brush loaded with epoxy along the edges and slotted the lower four staves together in the jig, then fitted the next three ( of eight) and the last one clicked into place with no problems, the vee in one edge making it easy to keep the pieces engaged until I got the cable ties around it and pulled up tight. With the test pieces glued up and rounded off to check the diameter inside and out, I made up the internal blocking piece and slid it in to check the fit. The end is cut to spread out the change in stiffness. I could have done with some extra slow hardener for the glue, or an extra pair of hands but it seems that I got the last one glued up before the first one had gone off too far to squeeze up. The wood being very porous I pre coated each glue face before applying the glue, that took time. The next one will be done by clamping the lot together and both pre coating and glue application will be done in single passes. Half way assembled. Internal blocking piece in place at each end and flat out to get the last pieces in place and clamped up before the epoxy goes stiff. I"ll do the next one in the cool of the night and might even put the epoxy in the fridge for a while to slow it down a bit. I’d made up a solid filler for about the lower 600mm and a 100mm at the top, the lower one to take the stresses where the mast will pass through the mast step, the end of that filler being deeply vee’ed to reduce the stress caused by the difference in stiffness (engineering talk calls that a “stress riser”). Tied the lot together with cable ties, and left it overnight. Looks ok, I'll be cutting a couple of centimetres off each end to true them up and those will show me how well they've fit together and how good or otherwise the bond is. 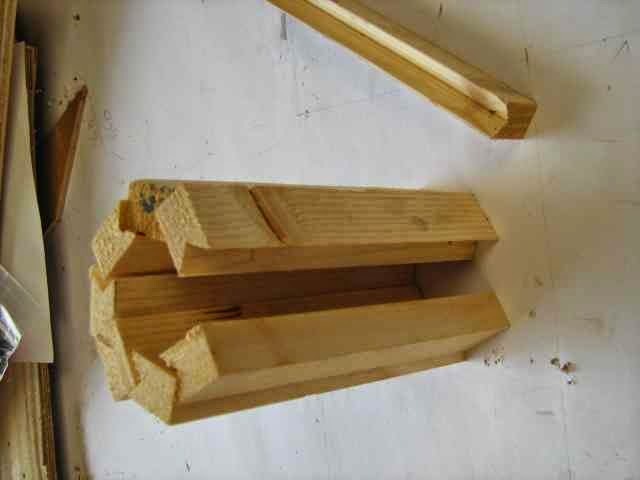 I've a second mast to build, but as I've sorted all the better staves out for the first one, will have to defect and scarf the staves, its to be a bit longer as well so there is work to do before I assemble that one. So now I’ve a long, quite light pole, it weighs in at 7.2 kg and I'd expect it to lose about 0.8 kg of that as its finished. There are glue drips and ridges to be planed off, a mass of shavings to be made and a lot of sanding to do. Then its back to the boat again, progress as always is much slower than I’d like and I’ve two weeks coming up when I wont be able to work on it but it is coming along. Later in the day, I'd completely forgotten that today is a public holiday, the list of things I was going to do could not work as so many places were closed. So it was walk the dog ( part of my own excersize program ) and back to the workshop. I clamped the blank "stick" to the edge of the temporary table I have in there, and attacked it with the power plane to rough it out. Then spent about an hour on it with the hand plane. The initial rounding off was done with a power plane which also dealt with the glue squeezeout, then it was the little Stanley number 3 hand plane. I like that, its much lighter and easier to use for this sort of work than the heavier number 4. I tapered the top 700mm to finish at 52mm diameter then got the rest of the section pretty well round before taking a belt from my small belt sander and cutting it at the joint to make a long strip. Being cloth backed its a lot tougher than paper backed abrasive, and by wrapping it around the mast to be and pulling on each end in turn at an angle and working along a little each stroke, am able to sand about half the circumference each pass. Thats 80 grit cloth backed ceramic engineering "sandpaper" made for metalworking. Not for any reason other than thats what I had, ordinary cloth backed belt sander belts are fine. I'll do a second run over it with 120, then finish it with 240 to get it ready for paint. Yes it will be painted, people ask me "what kind of varnish do you use John?" I reply "white paint". Cleanup time in the shed, the broom is one of the most frequently used tools I own. LOTS of shavings, thats nice work, a really sharp plane on nice even grained wood makes a lovely sound. Very satisfying.